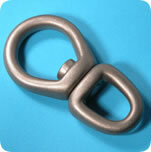 Our Eye & Eye Swivels are a great choice when a swivel is needed, but no removable pin is required. Swivels are just what you need to avoid line twisting. 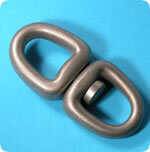 Titanium will never corrode and it is stronger and lighter and therefore safer. 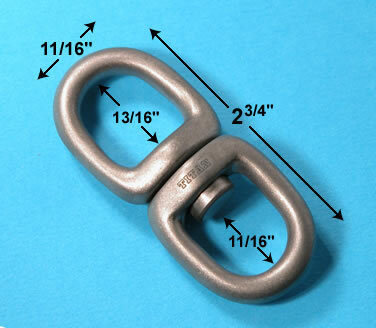 These corrosion-proof swivels will save you money because you won't have to replace them due to corrosion. 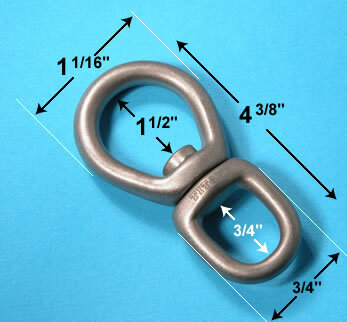 Learn more reasons why Titan Swivels are better! We have two styles to choose from. Just choose the style and size swivel that you want to buy below by clicking the "Click to Order" button and then enter the quantity that you would like in the shopping cart. It's so easy to buy online! In stock domestic orders ship the same day when placed business days before noon PST! 3-3/16" x 1-3/32" x 11/16" x 1-1/16" x 13/16"
Max. Safe Load: 6,394 lbs. Rec. Safe Working Load: 3,197 lbs. 4-3/8" x 1-1/2" x 3/4" x 1-1/16" x 3/4"
Max. Safe Load: 13,670 lbs. Rec. Safe Working Load: 6,835 lbs. 2-3/4" x 11/16" x 11/16" x 13/16"
3-3/4" x 25/32" x 25/32" x 1-1/16"